Montgomery County was at one time a thriving, integrated, socially and politically active town. Many factors allowed residen​ts to loosely organize into routes and safe-houses assisting freedom seekers. This book tells our county' s story; the legends of this incredible time, the people, and the stories told about them. ​Ultimately oral legend is transformed into oral history. 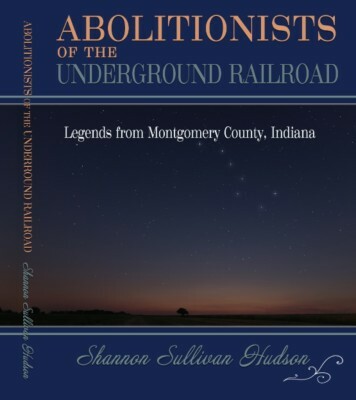 The book can be purchased at the Carnegie Museum, (765) 362-4618, Lane Place (765) 362-3416 or the Rotary Jail, (765) 362-5222, all in Crawfordsville. The book can also be purchaed through Amazon.com at by searching Shannon Sullivan Hudson. It is available in both soft cover and Kindle ebook.